I feel blessed to have a small chunk of this earth to call my own. I really do want to make the best of it. Yet, my efforts to create the attractive and productive outdoor space that I imagine have been woefully inadequate. While I dream of harvesting homegrown crops to feed my family the way I remember my mom doing it, the work required to transform my modest property into a personal utopia can feel downright overwhelming. In order to take control of the barrage of weeds and pests that are steadily working their way into my space, I need help. Fortunately, I’ve discovered a team of capable and enthusiastic workers right in my own backyard! And here’s the kicker—the more they work, the less they cost. Once again, I find that the answer to my problem is chickens. My chickens do yardwork! That’s right—if you ask my flock, yardwork is for the birds! I’m not sure there’s any more efficient natural method of bug reduction than free-ranging chickens. It’s one of the best ways my chickens do yardwork. Eyes on the prize, ladies! They patrol the area for countless hours, tirelessly watching for the tiniest twinge of movement in the grass. 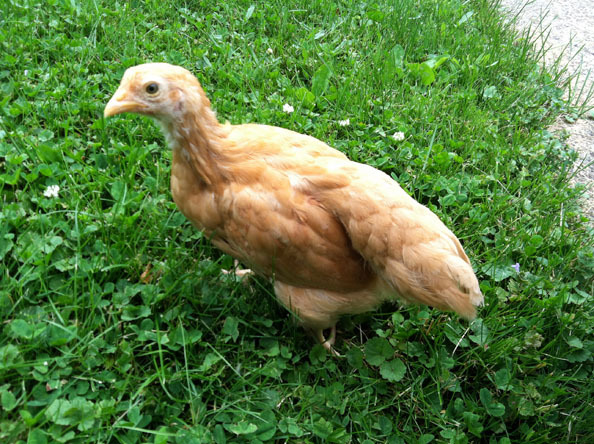 They move through the lawn, not unlike a front across a weather map, each chicken watching her own space for a treat, until one lucky hen finds a jackpot. In an instant, they all take notice and scramble to get their share of her treasure. Another way my chickens do yardwork is weeding. They’re great at clearing a space for a garden. The coolest part of the pest control and weeding is that it all translates into more nutritious eggs than you can get at a grocery store! With the task of clearing unwanted material from our space under way, I can move on to supplying fertile organic material for gardening. The heavy clay soil I find when I dig is in desperate need of supplementation. 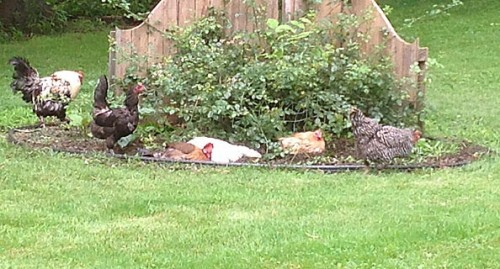 Once again, I find that my flock has risen to the challenge, and that my chickens do yardwork. First day of work at the fertilizer factory! Ah, chicken poop. The ubiquitous piles, plopped lovingly around my entire yard on a free-ranging day, are mostly concentrated in and around the run and coop. This is where I enlist the help of my heavy lifter, whom I married on account of his skills with a shovel. All the poopy goodness is semi-regularly scooped out of the run (with whatever bedding substrate I was able to get my hands on) and into the neighboring compost area, where it is mixed with other goodies for a surprisingly beautiful end product. I had this idea of a neat little compost area, divided into distinct areas of new materials, aging pre-compost and finished product. I’ve seen it done in magazines, so I know it’s possible. However, my management system ended up working quite differently. Even though my composting area is not what I originally envisioned–looking more like piles of dirt with some food bits mixed in–I’ve still managed to make some pretty fertile material with the help of my feathered friends! Once again, my chickens do yardwork. Scratching around the compost pile is my flock’s favorite thing to do in the whole, wide world. They make a beeline for it every time the run door is opened. They look for tasty kitchen scraps in the first bin, find worms in the second, and dig bathing pits in the softest pile to reward themselves for their hard work. 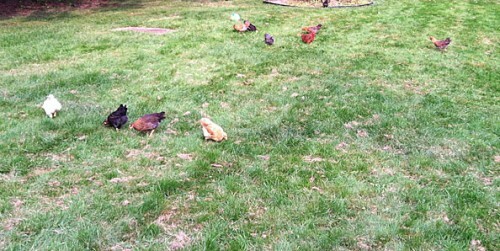 My chickens have been a significant help in the quest for my ideal lawn. Even their very existence is a giant step toward the goal. Yet, I will acknowledge that there are jobs for which they are not especially helpful. Do not count on your chickens’ help for mulching jobs. If you have those beautiful, manicured, picture-perfect flower beds that I’ve seen in other people’s yards, chickens will almost certainly not be welcome helpers. 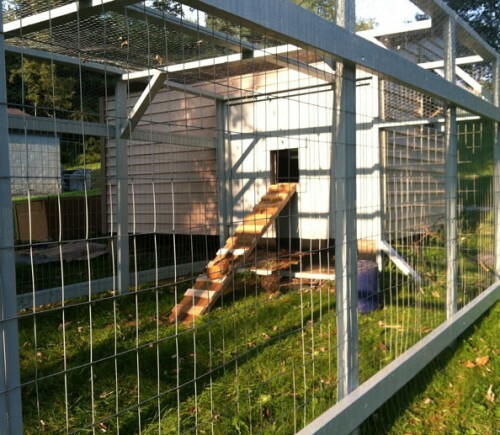 If you don’t take proper precautions, your chickens will do yardwork you don’t want them to do. They will rake every bit of mulch out of a bed and into the yard. They do look cute while they’re doing it, though. 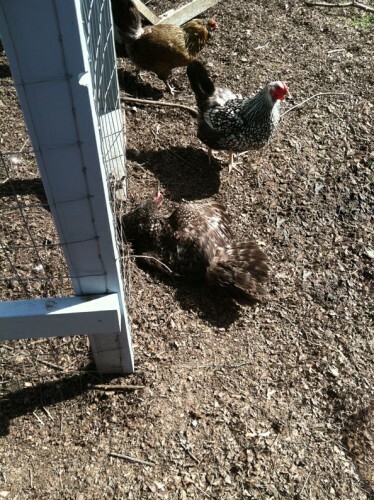 A handful of sunning chickens works as mulch, right? 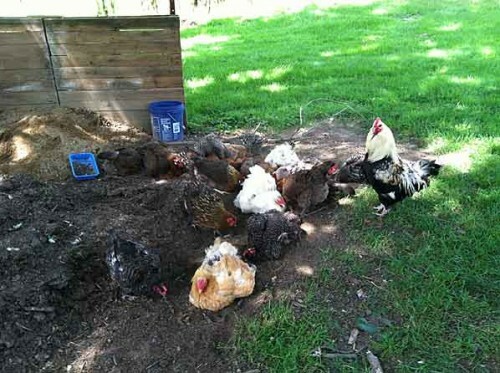 Once you’ve tired of their adorable antics, and you’re looking for some real-world solutions to chickens v. flower beds, learn how to keep your chickens from scattering mulch. There are plenty of others here who have discovered the joy of chicken poo and the many chicken manure benefits for the garden. I am still working toward my gardening goal. If you find yourself a step or two ahead of me, you can move on to learning about chickens and gardening and making the best of your garden helpers. Soon, you may find yourself gardening for your chickens as a way to reward them for all their help. For the most part, I’ve found chickens make great companions in the yard. As you have seen, your flock can be a great help, if well managed, or a significant hindrance, if not. Personally, I like to walk the line between the two. And I prefer to walk it with my chickens in tow. How do you have your chickens do yardwork? Please let us know in the comments!